When I was a lad, motor sport was my passion. I was very lucky to live close to Crystal Palace which, at the time, had a motor racing circuit that was noted for the quality of drivers that would attend the races. With my best friend, Roger, we would get a 49 bus from Streatham Common up to the Palace, as we called it, every bank holiday. According to my information, Jack Sears took part in the saloon car race at the Palace on Whit Monday in 1962 in a 3.4 Mk.II Jaguar. It is inconceivable that I wasn't there on that day. To remember the wonderful times that I had there, it was with great delight that I saw the Tamiya Mk.II racing Jaguar up for auction on EBay. I won it with a bid of £22.51 - bargain! 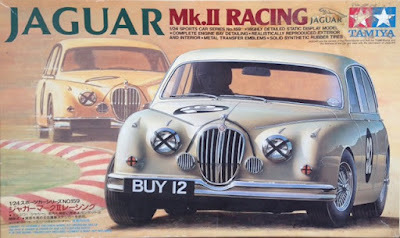 The model is of that same Jaguar that was at Crystal Palace on that Monday. The kit is a usual Tamiya kit and goes together without any problems at all. I have changed the way that I handle metal finishes. My wife really disliked me using Alclad because the smell lingered for hours in our apartment. Recently, my favourite paint manufacturer - Vallejo - released a range of acrylic paints that do exactly what Alclad does - give you a finish that looks like metal. The other good thing is that, with care, it can be hand brushed to touch up. The first thing I do with any car kit is to remove all of the shiny chrome that they put on the wheels and some of the body work. To me, the chrome finish isn't realistic and creates problems once the items have been cut off the sprue. This always leaves a small area without chrome which is impossible to touch up. I have my trusty can of Mr. Muscle Oven Cleaner. I was told, via the internet, to put the sprue into a plastic bag, spray the Mr. Muscle into the bag, seal it up and leave it for 24 hours. I have found that is all unnecessary. I put out a sheet of metal foil on the kitchen sink. Place the sprue on the foil and spray it with the Mr. Muscle. I use a pair of tweezers to turn the sprue over. I have found that if you do this and walk away for about 5 minutes, on coming back, all of the chrome will be gone. A quick wash and it is done and dusted! 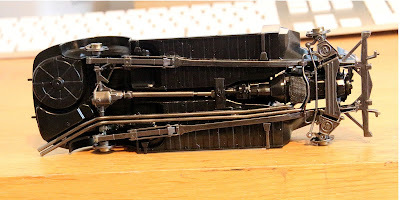 OK, so I started on the chassis. First off, I put the engine together. I had a look around the internet to see if I could do any small bits of enhancement. I found that the obvious thing that was missing was the ignition leads. I stripped a short length of flexible wire to get to the thin strands inside. A bit of jiggling and super glue and it was in place. 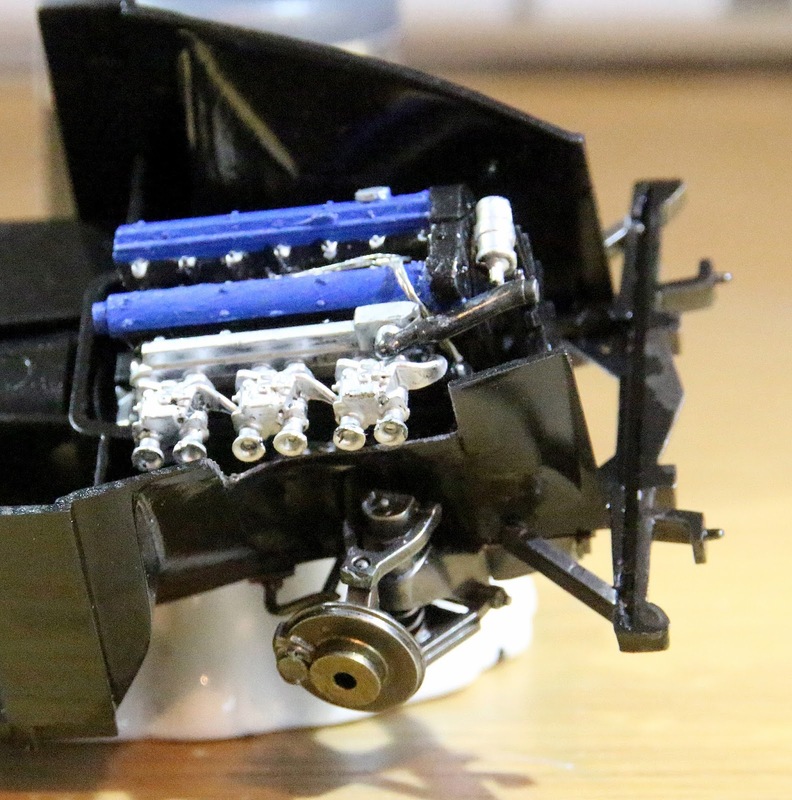 Fortunately, the lower part of the engine is hidden so I didn't have to attach that end to anything. 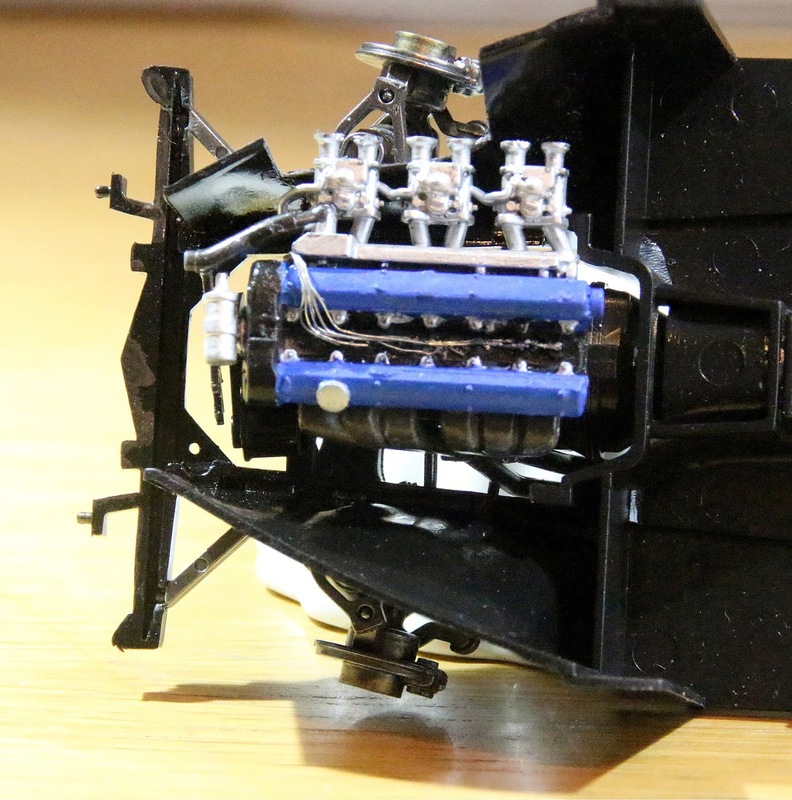 I gave the chassis a coat of the Vallejo Metal Colour Gloss Black undercoat and all of the chassis part a coat of steel. The chassis is now complete so I am starting work on the interior.